In accordance with The Beatitudes and Matthew 25:31-45, a judgment of the worthy is presently underway, beginning with group/nation evaluations, followed by individual evaluations. 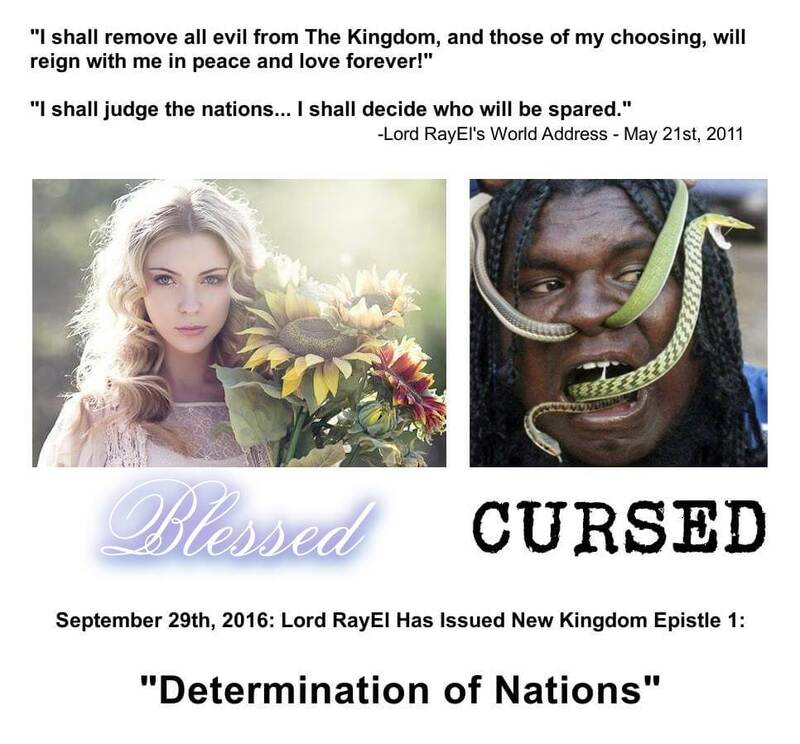 Lord RayEl’s final group/nation decision, is that the largest percentage of people who will be saved, will come from White European ancestry, while the largest percentage to be cursed, will be of Black African ancestry. All other groups have been placed between these two ends of the decisional spectrum, with varying degrees of blessing/cursing, based upon the above criteria. The full public text of New Kingdom Epistle 1: “Determination of Nations”, will be released in the coming days, after we have had an opportunity to explain the reasoning behind his decisions. This explanation period is a courtesy granted by Lord RayEl, so that all may better understand themselves, others, and the ways of the New Kingdom. 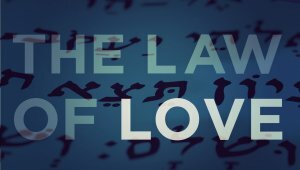 We will begin with some statistical analysis that is used to determine fulfillment of the promise of Matthew 5:5. 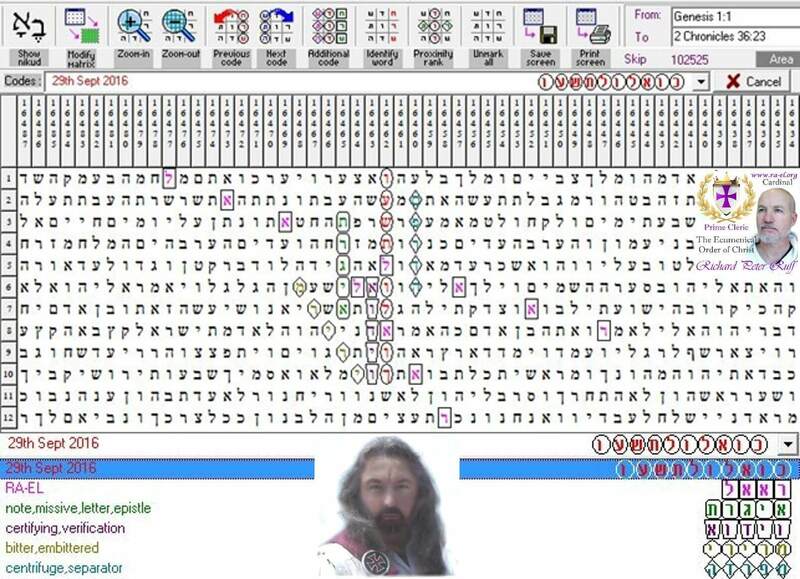 I will just tell you all that Cardinal Richard Ruff had NO knowledge of this Epistle coming today, when he released the Torah Code for today’s date… Obviously I can’t prove that to you, so this time you can choose to believe me of not, based on my reputation. In the Bible, “Nations” means a people, not a bordered geographical location, so essentially some people, based on their worthiness, will be saved when the SHTF, and will then be replaced on the Earth when the situation passes. Far, far, far more white people are beaten, robbed, raped and murdered by black people then the opposite every year… That’s oppression. Black people were brought into white countries as workers, they were given an exponentially better life than they had in the jungle, where they suffered from constant disease and hunger while neighboring tribes regularly raided, kidnapped, raped, ate and murdered each other (all of which is still happening today). Whites only possessed a small amount of slaves, while the majority of slaves were owned by other Africans and Arabic countries (as it still is today). Whites made their slaves work hard, but they also fed them, clothed them, housed them, educated them, and freed them, integrating them into white society. Whites went into the worst parts of Africa, colonized it, built civilizations with food, clean water, hospitals, schools, and then turned over the ruling authority to the native Africans… Who quickly corrupted the governments, began murdering white farmers and settlers, and now have a continent full of failed states. White people organized charities to go help bring food, clean water, medicine and housing to poor black people all over the world, even in countries like the United States. White people passed laws to give black people free monthly food vouchers, free medical care, free education all the way from preschool through college, free housing and paid living expenses for them and their children, while also passing laws giving them preferential status in going to school, getting a private sector job, getting a mortgage, getting an apartment, getting a business loan, getting government jobs, etc. Under “white oppression”, some of the wealthiest and most powerful people in America (and the world) including the US President are now black… While many of them, I must remind you, are still living in the same jungle conditions they were thousands of years ago. 1. During slavery, relatively few blacks were raped or killed by whites, because they were expensive property, and the cost of replacing and retraining was significant, so hangings were normally only in response to a serious crime committed by a slave against a white person. 2. Segregation was not a tool of hatred, it was a tool of sanitation. White people during the time practiced superior sanitation to black people, who were still only a few years removed from the jungle and slavery; they were often lice and parasite infested, and regularly had open STD sores, until they fully adopted the ways of Western culture. White women were getting sexually harrassed in public areas, and bringing home pubic-crabs when using shared toilets, so white society answered the problem by segregation. If whites were evil racists, they could have simply refused to let blacks have access to public facilities and transportation (which the whites were paying for, since they were the ones taxed the most), but instead, whites showed Christian generosity, and gave black people use of their things, just separate use. 3. To call lack of getting a Hip Hop record deal in England “oppression”, is like saying Haitian Mambos are treated unfairly because they can’t sell voodoo dolls at the Vatican. o.O British businesses are market driven, and at the time Hip Hop was struggling, it was because British consumers, who were primarily white, did not yet embrace the new black music genre, and record companies are not charities, they invest their money in what is selling well. “THE N-WORD”: Some people have mentioned the disrespect the early English and Americans showed them by calling them the dreaded “N-Word”, but this too is a modern-day twisting of facts. The word was not some hateful label made up by evil white men to oppress and degrade black people, it was simply a common term to denote their primary place of origin, the region around the Niger River known today as Niger and Nigeria, it was no more derogatory than calling a Jewish person a “Jew”, a Grecian person a “Greek”, or a British person a “Brit”. The fulfilment of Matthew 25:41, but it’s possible some may only be cast into the “outer darkness”. Matthew 25:41 “Then the King will turn to those on the left and say, ‘Away with you, you cursed ones, into the eternal fire prepared for the devil and his demons.